9 best Christmas gift ideas for sports and fitness fanatics | What Hi-Fi? These gifts are bound to go down a storm with anyone who ventures near a treadmill. Alternatively, if they'd prefer to settle down in front of the football or darts, we've got options for them too. Yule be in their good books well into 2019. A fine pair of wireless in-ears. They're comfortable and sound great - ideal for throwing in your gym bag. The SoundSport Pulse versions even have their own heart rate sensor. If you prefer exercising outdoors, this wireless speaker will look the part parked next to your yoga mat. It will keep you entertained and withstand the elements thanks to its dustproof and waterproof design. As good as television content currently gets, Sky Q has more than its fair share of 4K Ultra HD sport on the menu, including Premier League football, cricket and Formula 1 all in 4K. A pricey Christmas present, but impressive nevertheless. If you're going to be watching 4K sport, then a good 4K TV will undoubtedly come in handy. And they don't get much better for the money than this superb 50in Philips set. It's a great choice at a relatively low price. Despite only having three front-facing drivers and an absence of upward-firing speakers, this clever Sony soundbar can handle Dolby Atmos and produce a virtual 7.1.2 listening experience. 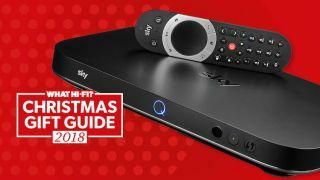 Perfect for those 4K football broadcasts through Sky Q. The latest version of the Apple Watch isn't just a fine activity tracker. You can also store a few tunes on its 16GB hard drive and use Bluetooth 5.0 to pair to your wireless headphones. If you don't want to get in a tangle down the gym, these wireless headphones from Sony should do the trick. A convenient design mixed with excellent sound quality. A portable, budget DAB/FM radio with decent enough sound for those who want their sporting fix while on the move. The ideal size for slipping into a Christmas stocking. The last thing you need is your phone (i.e your music source) dying halfway through a workout. Keep it topped up during the day with the help of this 10,000mAh power bank. It features Anker's own fast-charging tech, so you shouldn't have to wait around for too long to get your device up and running again.